It's time again for the Pets on Quilts Show! Each year Lily Pad Quilting hosts this fun virtual quilt show and since I have cats I will enter my quilt in the cats on quilt category. Our cats love to lay on the quilts when I leave it laying around. We miss these two so much. They both lived to a ripe old age. They love sleeping on this quilt that I draped over our couch. This is Duchess and she is the baby. As I was machine quilting this Memory Lane quilt that our girls and I made she got on it and started laying down and made herself comfortable. She is ready for a nap. Look at that big ole yawn. This is the Memory Lane quilt she laid on while I was still working on it. Here she is again, just plopped down on my quilt as I laid it out to take a picture. This is my Great Granny quilt. This quilt is nicely tucked away for a special occasion. Have fun with the quilt show! aw Duchess looks like my rescue cat Phoebe. when we were in the shelter discussing cats with the staff, Phoebe stuck her paw out and tapped hubs on the shoulder. I guess you could say she picked us! What a good picture of that yawn! Your babies are adorable! Duchess knows how to pick beautiful resting spots to make her look even more lovely. 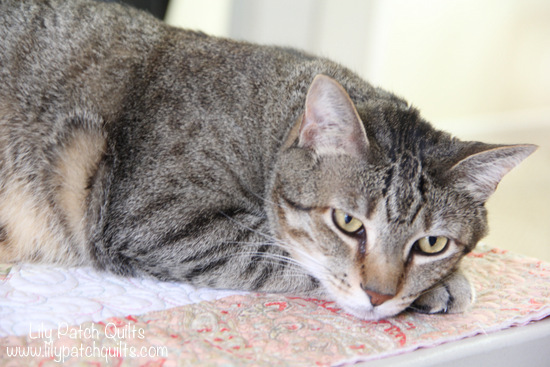 Your quilts are just gorgeous...and so are the kitties! Gracie and Smitty think your kitties are just purrfect. Just love the photo of the 'hole in the face' (what I call it when my furries yawn). That is a definite seal of approval for a quilt. They all look so comfy! Sweet kitties and beautiful quilts - a great mix. Lovely quilt inspectors and yes, that was quite a yawn! Great work catching it in a photo! They're all beautiful, including the quilts :). They're really is something about cats and quilts, it makes me want to lie down and cuddle with them. Such beautiful cats and quilts! Pets are great at sensing things - they always know how to steal the show when you are trying to photograph a quilt! Dutchess looks like she is not camera shy!! Looks like laying on a quilt is the purrrfect place to take a nap! 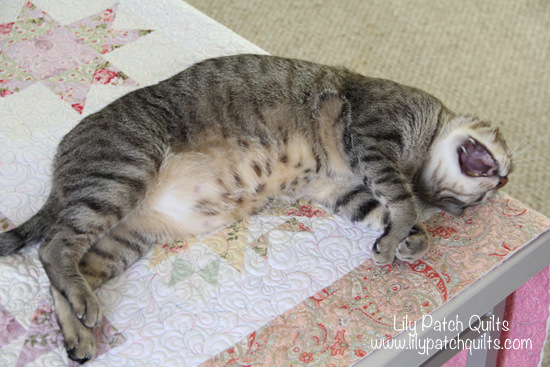 Your cats are adorable, and don't they always look so cute on quilts! Your Memory Lane quilt is lovely! Your colour choices are perfect. Duchess is doing her job well. I love your quilts. I love her little yawn and how she seems to just plop herself down on your quilts! Such a personality!! Cats do have such personalities. They all look lovely. Great pictures! Nice cays and beautiful quilts. Your older kitties had cat dreams come true in life. Having pets to love adds so much joy. Duchess cracks me up with that big yawn and your quilts are sure lovely Kim! What pretty soft coloring on Memory Lane! Love your cat and of course, the best place for them to lay is on your quilt or whatever you're working on.